Caroline (right) on the podium at the 2014 Commonwealth Games. 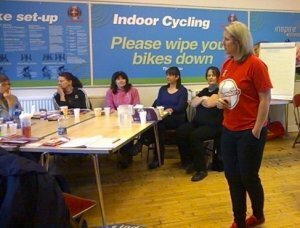 2014 Commonwealth Games bronze medallist Caroline Povey was one of 24 people who attended a female-only Workplace Challenge Champion training course which took place at Queens Park Sport Centre in Chesterfield in November 2015. Caroline is Marketing Manager at Pinelodge Holidays, which runs Darwin Forest Country Park and Sandybrook Country Park. 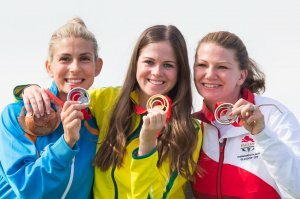 Caroline said: "I am a Commonwealth Games Bronze medallist in Clay Shooting and although shooting is not the most physically demanding sport, I am really keen to get more people passionate about sport and having an active lifestyle. "As well as shooting I am a keen runner and love getting out in the great outdoors. "I had heard about the Workplace Challenge through Active Derbyshire and Derbyshire Sport and could see the benefits it could bring to my workplace. "I thought my colleagues would really enjoy getting involved as many already lead an active lifestyle and I could also see the benefits to the company with a more active and healthy workforce taking less time off sick and being more motivated. "The course was really enjoyable with lots of interesting facts about why having a healthy workforce is important and the benefits it has to both employees and employers. "There was also lots of opportunities to share best practice and to find out about initiatives that have worked for others. "In the afternoon there were also practical sessions so you could get involved and try out some new sporting activities. "If you are interested in leading a more active and healthy lifestyle and think that your colleagues will benefit from the added motivation of being active as part of a team then it is definitely worth taking part in the training."